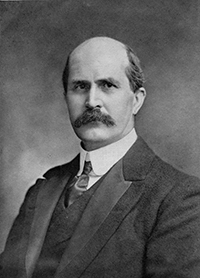 Sir William Henry Bragg was a crystallographer at University College, London. He and his son William Lawrence Bragg were awarded the 1915 Nobel Prize in Physics "for their services in the analysis of crystal structure by means of X-rays." William Henry Bragg was a Professor of Physics at University of Adelaide, Leeds University, University College of London, and the Royal Institution of Great Britain. July 2, 1862Birth, Wigton (England). 1884Obtained Part I degree in Mathematics Tripos, Trinity College, Cambridge (England). 1885Obtained Part II degree in Mathematics in Tripos, First Class Honours, Trinity College, Cambridge (England). 1885 – 1886Researcher, Cavendish Laboratory, Cambridge (England). 1886 – 1909Professor of Mathematics and Physics, University of Adelaide, Adelaide (S.A.). 1909 – 1915Cavendish Professor of Physics, Leeds University, Leeds (England). 1915Awarded Nobel Prize in Physics with son William Lawrence Bragg "for their services in the analysis of crystal structure by means of x-rays". 1915 – 1925Quain Professor of Physics, University College of London, London (England). 1917Appointed Commander of the Most Excellent Order of the British Empire (CBE). 1920 – 1942Honorary Fellow, Trinity College, Cambridge (England). 1923Fullerian Professor of Chemistry and Director, Royal Institution of Great Britain, London (England). 1934Co-wrote "The Crystalline State" with son William Lawrence Bragg. 1935 – 1940President, Royal Society. 1936Co-wrote "Electricity" with son William Lawrence Bragg. 1937Co-wrote "Atomic Structure of Minerals" with son William Lawrence Bragg. March 10, 1942Death, London (England). Son. Advised by father at University of Leeds and awarded 1915 Nobel Prize in Physics with father William Henry Bragg. Advised by Bragg at University of Leeds. Advised by Bragg at the Royal Institution. Advised by Bragg at University College of London (UCL). Advised by Bragg at University of London. Robertson, J. Monteath (John Monteath). Fullerian Professor of Chemistry and Director. Professor of Mathematics and Physics. Obtained Part I (1884) and Part II (1885) degrees in Mathematics in Tripos. History of Sound Ranging, 1914-1918. Humphrey Davy, Michael Faraday, William Grove, John Tyndall and William Bragg papers [microfilm], 1837-1938, records of the secretary. Sir William Henry Bragg miscellaneous correspondence. Sir William Henry Bragg miscellaneous letters, 1907-1931. William H. Bragg letters to Gerald Willis Fox, 1931-1936. William H. Bragg research notes on x-rays, 1913. William Henry Bragg correspondence with Ernest Rutherford, 1904-1933. William Lawrence Bragg selected reprints, 1920-1969. Arthur Lionel Rogers papers, 1885-1986. David C. Phillips papers, 1935-1994. Job application and testimonials, 1911-1914. John Percival Vissing Madsen papers, 1906-1969. Oliver Heaviside selected papers [microform], 1874-1922. Oral history interview with Dorothy Heyworth, 1979 March 14. Oral history interview with Harry Jones, 1981 January 20. Oral history interview with Lucy Wilson, 1978 October 4 and December 6. Oral history interview with Norman Feather, 1971 February 25 and 5 November. Sir George Porter papers, 1938-1999. Sydney Chapman festschrift material [microform], 1968. Concerning the nature of things/ by Sir William Bragg ... illustrated with many diagrams and plates. Concerning the nature of things; six lectures delivered at the Royal Institution. Craftsmanship and science: (Presidential address to the British association, September 5, 1928)/ by Prof; sir William Bragg...with two supplementary addresses. Durchang der [Alpha-, Beta-, Gamma-] und Röntgen-Strahlen durch Materie/ von W.H. Bragg; Deutsch von Max Iklé. Physical sciences. Edited by Sir William Lawrence Bragg and George Porter. Recent advances in physics: notes of four lectures to scientific works in industry/ by W.L. Bragg. The development of x-ray analysis/ by Sir Lawrence Bragg; edited by B.C. Phillips and H. Lipson. The history of x-ray anaylsis/ by Sir Lawrence Bragg. The world of sound [microform]: six lectures delivered before a juvenile auditory at the Royal Institution, Christmas, 1919/ by Sir William Bragg. Was ist Materie: sechs gemeinverständliche Vortr̈ge, gehalten in der Royal Institution/ von Sir William Bragg ... ; autorisierte übersetzung von Dr. Finkelstein. X-rays and crystal structure/ by Sir W.H. Bragg and W.L. Bragg. Light is a messenger: the life and science of William Lawrence Bragg/ Graeme K. Hunter. The Legacy of Sir Lawrence Bragg: selections and reflections/ edited by John M. Thomas, Sir David Phillips. William and Lawrence Bragg, father and son: the most extraordinary collaboration in science/ John Jenkin. William Bragg Nobel Prize biography. William Henry Bragg and William Lawrence Bragg: a bibliography of their non-technical writings/ [compiled by Henry Lowood]. William Henry Bragg, 1862-1942: man and scientist/ G. M. Caroe.